Tiles in many ways transform the interior of a building from a dull combination of floors, walls, and ceilings. Tiles have been in use as interior decoration pieces as far back as 4,700 B.C in Egypt. Different cultures have made tiles with different kinds of materials such as clay, porcelain, marble metal, wood, glass and more over the centuries, and the innovation is not about to stop now. Marble tiles are luxurious by the standards of top interior designers in the world and indeed will add a touch of glamour and class to your interior spaces. Grey marble has natural grey mosaic detail, and they are perfect for your hallways as well as bathrooms. The grey mosaic and its dense structure make it the ideal tile for the areas in your home or building that are frequently in use. Below are the tips for choosing luxury marble tiles. After measuring out your spaces that you need to lay with tiles, ensure you purchase and extra 10% of the tiles you will need. The extra tiles are for replacing tiles that crack and break while on transit or during installation. Most companies that manufacture the grey marble tiles will accept to refund you for any unused box of tiles. 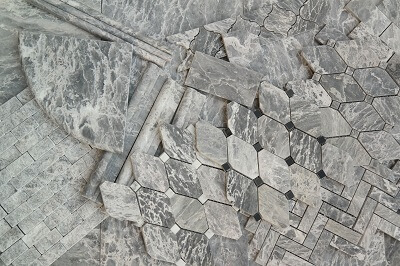 The natural grey mosaic of grey marble tiles varies with the location of the mine of the marble. For a refined and bold look and style, consider different shades of grey as well as different mosaics. Upon installation, you can use a particular code to match the shades of grey and the mosaics and achieve a unique feel to the room. The big the tile is not always the best option. If your desired design will require many tile cuts, it is better to go with smaller tiles other than big ones. The smaller tiles will give a better flow to your floor design and will come off as elegant and luxurious. Choose a grey tile grout that matches the color of your tiles, and in this way, the design will be glamorous and flawless in finishing. Luxury floors tiles come with different PEI ratings that represent how long it will start wearing out. The intended use of the area you are installing will guide you on which kind of PEI rating to consider. PEI ratings range from class 1- class 5. Classes 2 through 5 are for areas where there is foot traffic and the area you are installing the tiles will guide you on the PEI rating of your grey marble tiles. This especially is for first-time grey marble tiles buyers. Sales executives of grey marble luxury tile are well equipped with the necessary information and experience to give you direction on how to install and maintain the tiles. They will easily guide you to information that you otherwise did not know you needed regarding the sealing and treating of the grey marble luxury tiles with the grey mosaic. The above tips will put you well on your road to acquiring and maintaining your grey marble luxury tiles. Do not compromise on the price of the tiles, as grey mosaic marble luxury tiles do not come cheap.